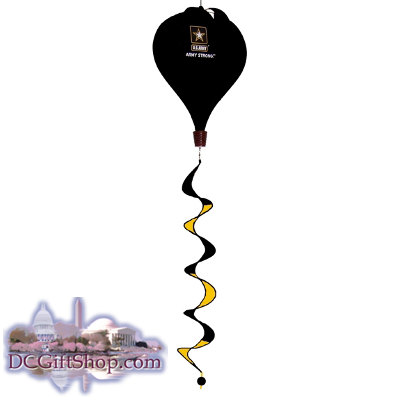 The US Army Strong Hot Air Balloon is made with quality weather resistant polyester and features the Army star along with the words, "Army Strong" on three sides. To help keep the balloon shape this item is supported by fiberglass rods while the graphics are silk screen printed. Complete with a 26 inch twisting tail the Army Strong Balloon measures an impressive 16 inches by 12 inches. Show off your American pride with this fun summertime tribute to the United States Army. This item is an officially licensed product by the U.S. Army.